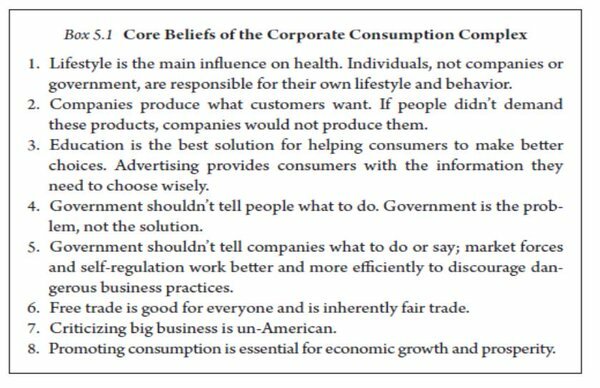 The above image, detailing the eight core beliefs of the corporate consumption complex, was part of a recent presentation by Professor Nicholas Freudenberg of the City University of New York School of Public Health. The presentation, titled “Changing Corporate Practices to Reduce Non-Communicable Diseases And Injuries: A Promising Strategy For Improving Global Public Health?” can be viewed here. Another great slide looks at the ten ways consumer industries contributed to elevated non-communicable disease risk. Among them: making disease-promoting (i.e. : junk food) products ubiquitous, supersizing products, and target marketing to vulnerable populations (as the soda and fast food industries repeatedly do).